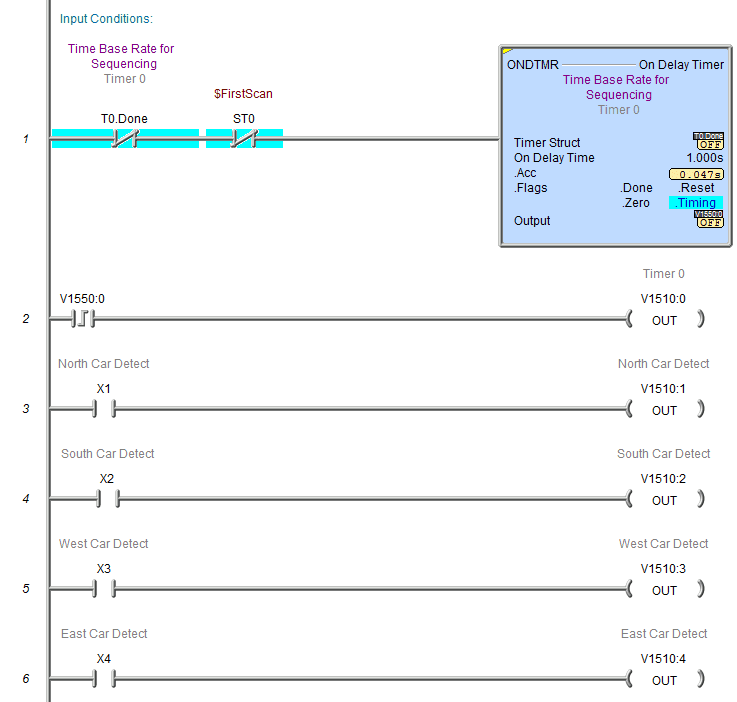 In part 1 we looked at writing PLC programs to control a traffic light using discrete bits and then using timed sequencing using indirect addressing. Part 2 used indirect addressing for inputs as well as output to control the sequence of pneumatic (air) cylinders in the program. Part 3 returned to the traffic light application and expand our program significantly. We looked at the sequence of operation using Input, output and mask tables. 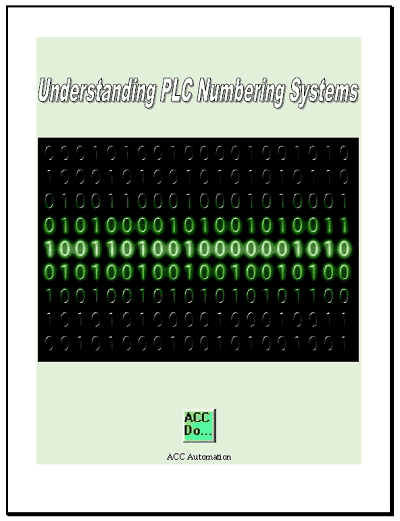 Part 4 will now continue with the programming of the logic in the PLC. 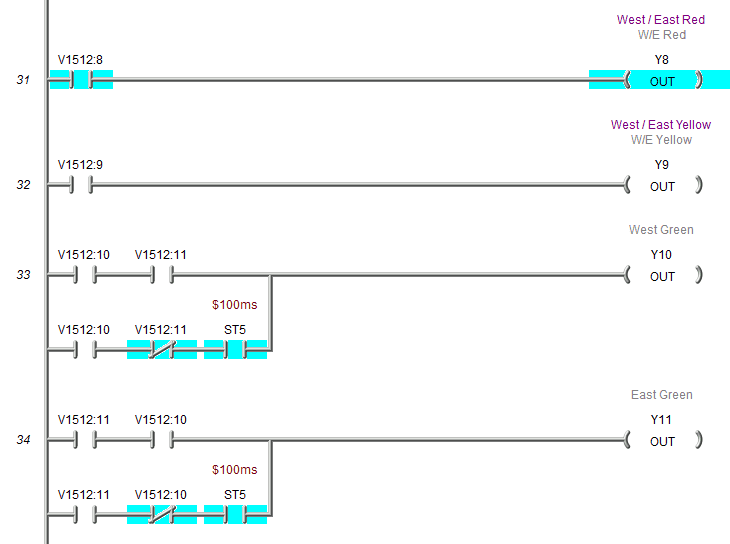 Note that I have colour coded the outputs that will be on in the sequence. This makes it easier to read how the lights will behave. All bits without ‘1’ are assumed to be ‘0’. The pedestrian walk signals flash before they change to the do not walk signals. The weekend sequence looks like this. We have overlap of the red signal lights. The arrows are not used. The weekday off peak times sequence looks like this. We have an advanced flashing green light for the north and west traffic. 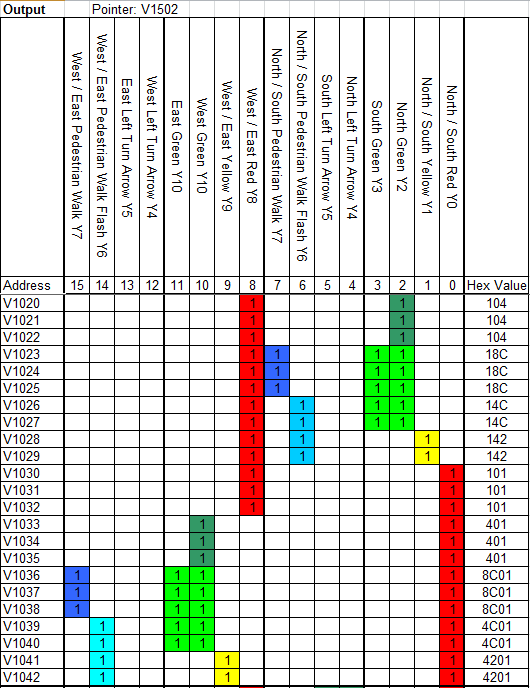 The weekday peak times sequence is as follows. The turn arrows have been added for the north/south and west/east directions. It is important to note that the sequencing and information contained in these charts must be understood fully before programming can begin. Take the time to review and understand the following tables. 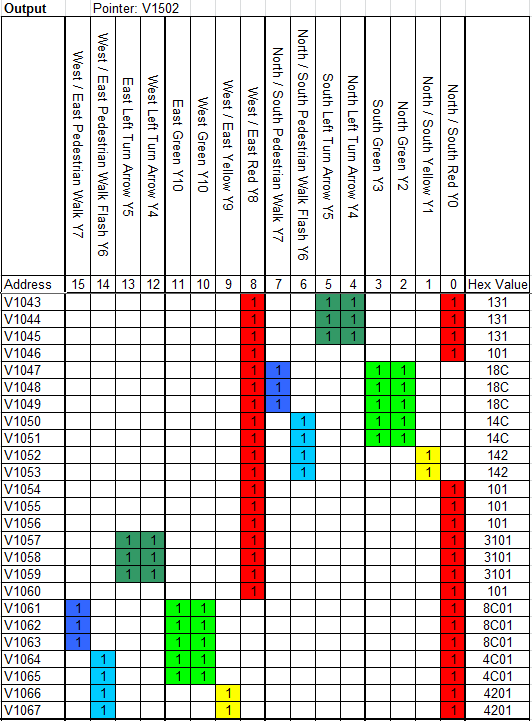 Here is a copy of the excel table complete with the inputs, mask and outputs. Easily understood logic to follow. 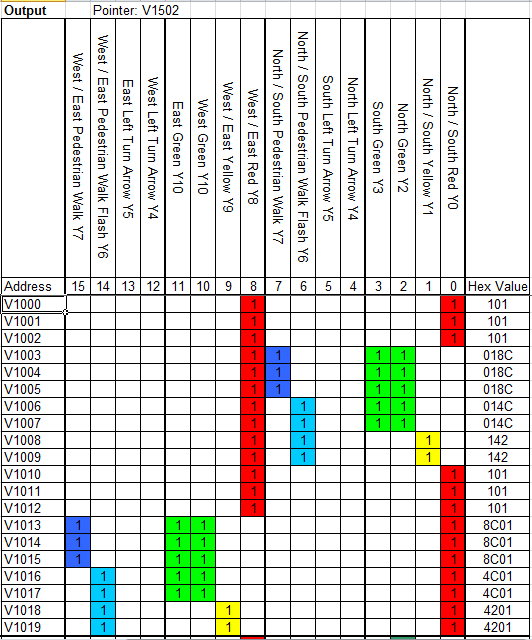 Looking at he pointers can the on compare instruction will quickly tell you what sensor is not being made. Troubleshooting this method of programming is easily done. Compare the bits in the input pointed word to the actual bits form the input in binary format. The difference is the input/output that is not working. Inputs – Setting bits in the input channel based upon actual and internal conditions. 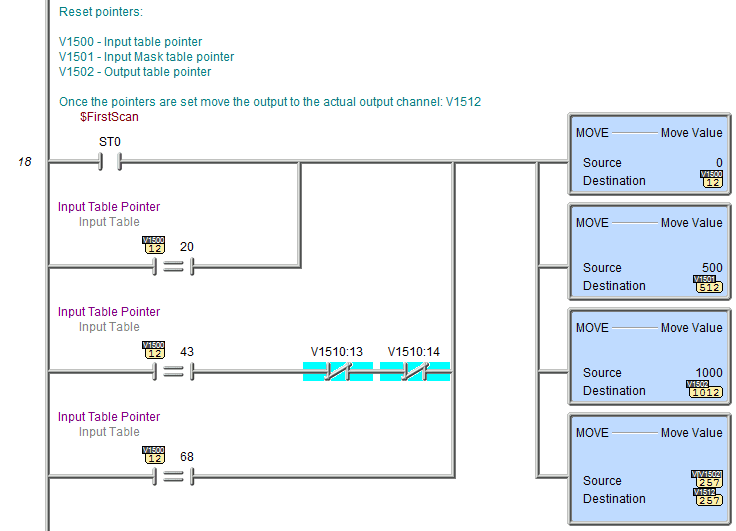 Control – Control of the pointers, mask and setting the output channel. Outputs – Using the output channel to activate the actual and internal actions required. The program is all controlled by one on-delay timer. This sets the minimum time between each step. This section of the control will tell the PLC what to do when the unit is first powered on. It resets the pointers and moves the initial output setting to the output word. 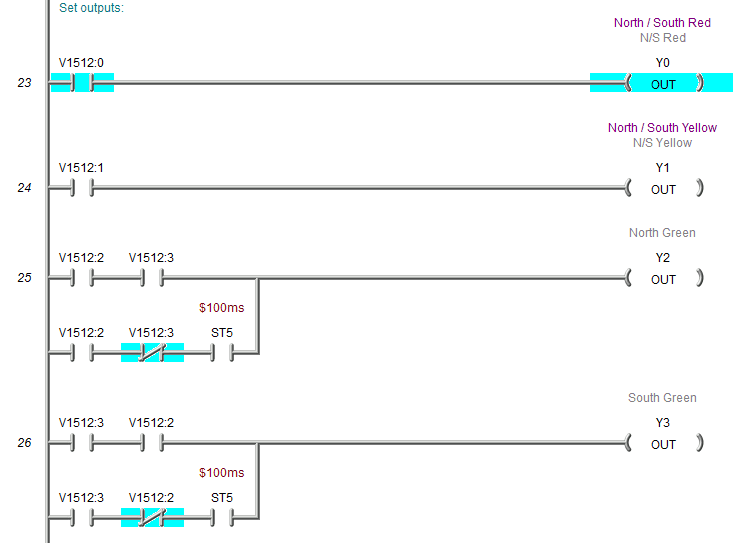 You will see that since we have three different sequences running, there are three different reset rungs in parallel. 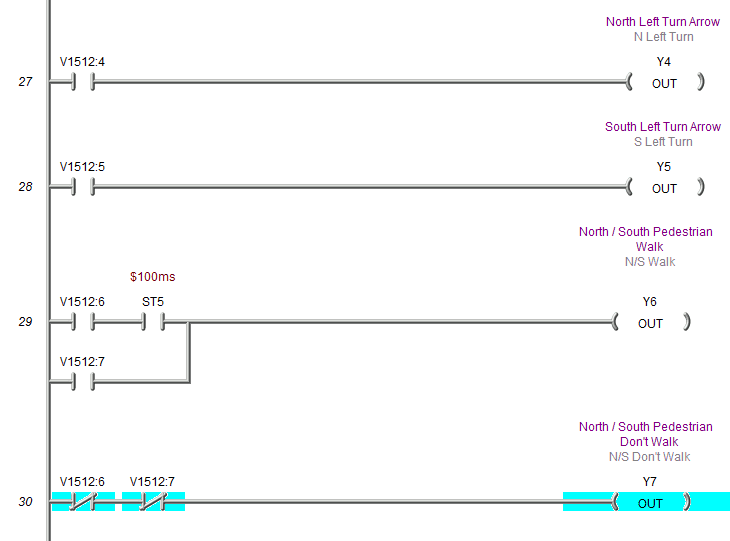 The table input pointer is compared to the last value +1 of the sequence running. The mask calculation is next. This is used to ignore the inputs that we do not want to see or may not know the status during the execution of the program. You will notice that the first three sequences are all the same. On this step we then determine if the pointers need to be changed for the other two. The first is for weekday off peak times. This is for the weekday peak times. We now compare the actual inputs after the mask with the input table word. If they are equal then move the output table word to the output channel and increment the pointers to the next step. The actual outputs are set using the output word bits. You will note that the flashing green lights are done when both green outputs are not on. 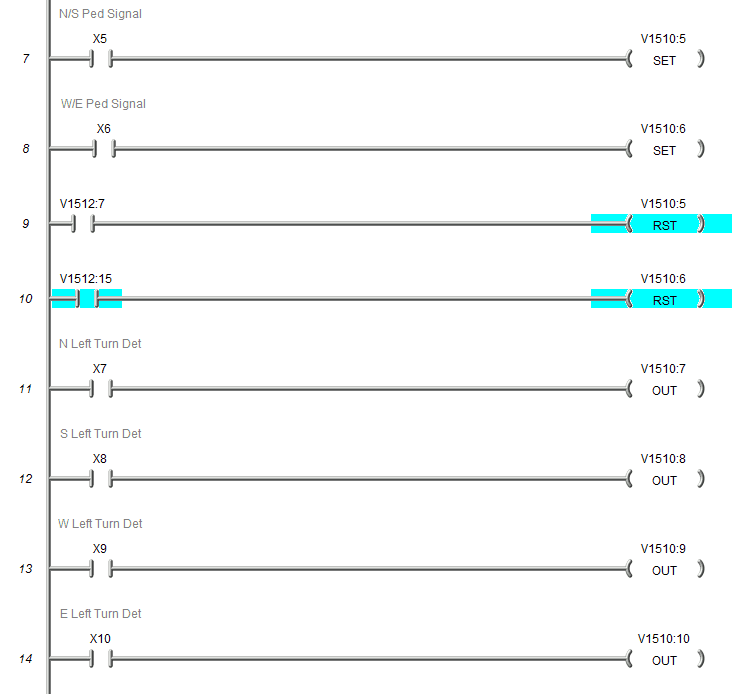 This way will give me the greatest flexibility when developing different sequences. 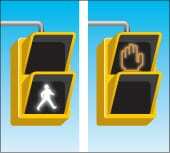 The do not walk signal is not part of the sequence but is controlled when the flashing walk or walk is not on. 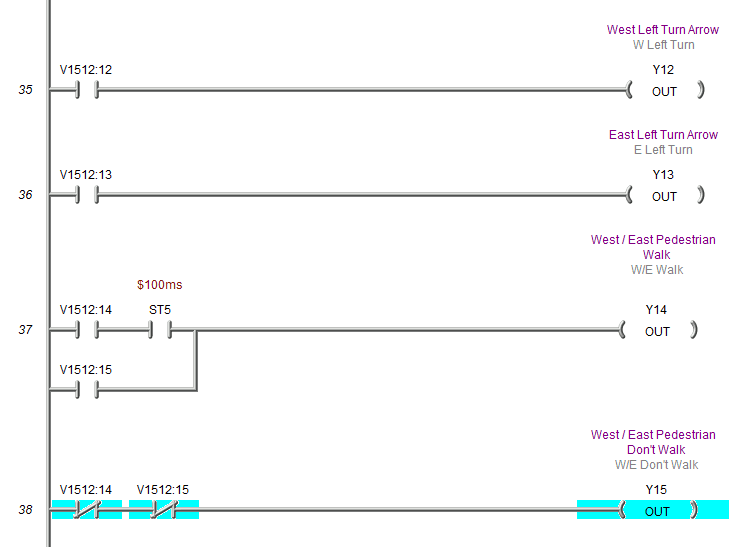 The program will not change much for completely different sequences. 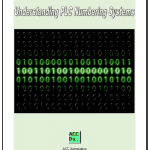 This program and the data tables can be downloaded here. Note that in order to run this program you must call up the input, mask and output tables and write them to the simulator or PLC. In Part 5 will will make a Game of Simon by learning all about bit manipulation and sequencers.